Respiratory distress syndrome (RDS) occurs most often in infants who are born too early. RDS can cause breathing difficulty in newborns. If it is not properly treated, RDS can result in complications. This may include pneumonia, respiratory failure, chronic lung problems, and possibly asthma. In severe cases, RDS can lead to convulsions and death. 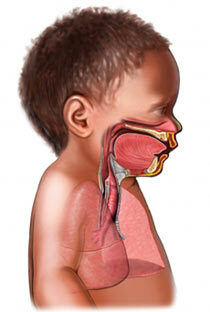 RDS occurs when an infant's lungs have not developed enough. Immature lungs lack a fluid called surfactant. This is a foamy liquid that helps the lungs open wide and take in air. When there is not enough surfactant, the lungs do not open well. This will make it difficult for the infant to breathe. The chance of developing RDS decreases as the fetus grows. Babies born after 36 weeks rarely develop this condition. This condition is more common in males. A mechanical ventilator is a breathing machine. It is used to keep the lungs from collapsing and support the baby's breathing. The ventilator also improves the exchange of oxygen and other gases in the lungs. A ventilator is almost always needed for infants with severe RDS. Surfactant can be given to help the lungs open. Wider lungs will allow the infant to take in more oxygen and breathe normally. One type of surfactant comes from cows and the other is synthetic. Both options are delivered directly into the infant's windpipe. Nitric oxide is a gas that is inhaled. It can make it easier for oxygen to pass into the blood. The gas is often delivered during mechanical ventilation. Get good prenatal care. Start as early as possible in pregnancy. Eat a healthful diet. Take vitamins as suggested by your doctor. Do not smoke. Avoid alcohol or drug use. Only take medications that your doctor has approved. You may be given steroids about 24 hours before delivery. Steroids can help your baby's lungs develop faster. Your doctor may do an amniocentesis. This test will check the maturity of your baby's lungs. The results will help determine the best time for delivery. Preventative treatments may be given to premature babies with a very high chance of developing RDS. These may include nasal continuous positive airway pressure (CPAP) or surfactant. The treatments are given soon after birth. Respiratory distress syndrome (RDS) of the newborn. EBSCO DynaMed Plus website. Available at: http://www.dynamed.com/topics/dmp~AN~T114184/Respiratory-distress-syndrome-RDS-of-the-newborn . Updated June 26, 2017. Accessed September 21, 2017. Hermansen C, Lorah K. Respiratory Distress in the Newborn. Am Fam Physician. 2007 Oct 1;76(7):987-994. Respiratory distress syndrome. The Merck Manual Professional Edition website. Available at: http://www.merckmanuals.com/professional/pediatrics/respiratory%5Fdisorders%5Fin%5Fneonates/respiratory%5Fdistress%5Fsyndrome.html. Updated January 2015. Accessed September 21, 2017.